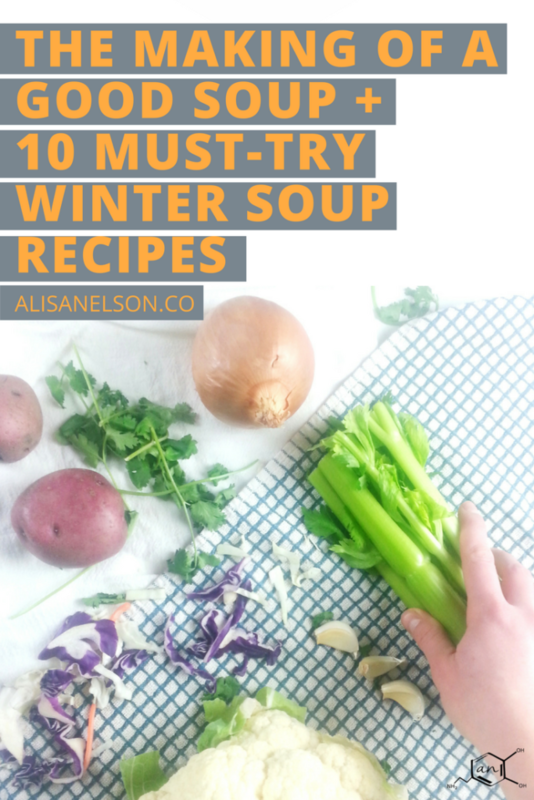 Today I’m sharing my guidelines for making a good soup plus 10 winter soup + chili recipes. 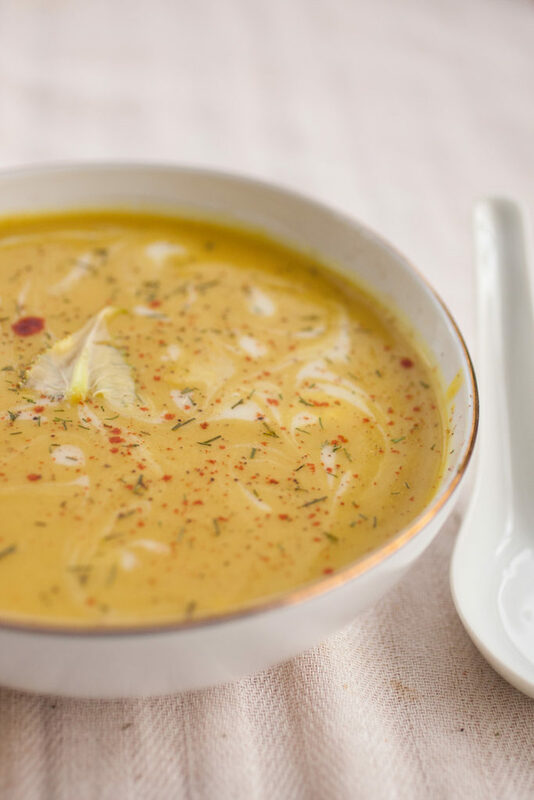 Soups are an easy way to prepare meals ahead of time, can be packed to the gills with nutrients, and are easy to adapt to whatever you have in the fridge/freezer. 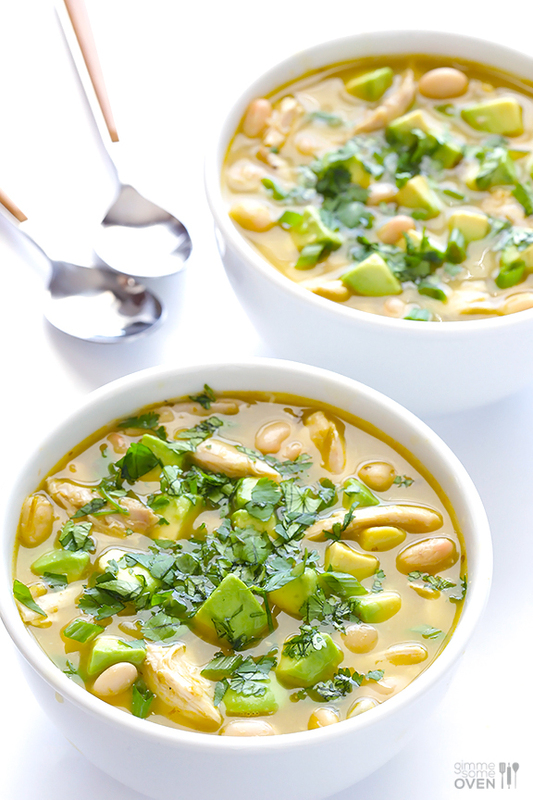 Finish out the winter without getting bored in your meal plan! Hands down, food is my favorite part of winter. 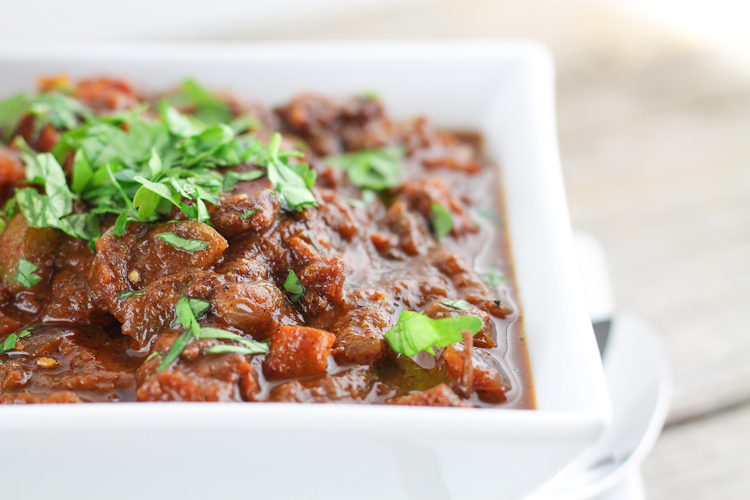 Soups + Chili in the slow cooker all day, the smell of curry, roasted veggies, juicy pot roast – these are my comfort foods. Since I hear over and over again that meal planning is one of the more frustrating pieces of making healthy changes I’ve decided to begin sharing my pretty simple approach to feeding my family. 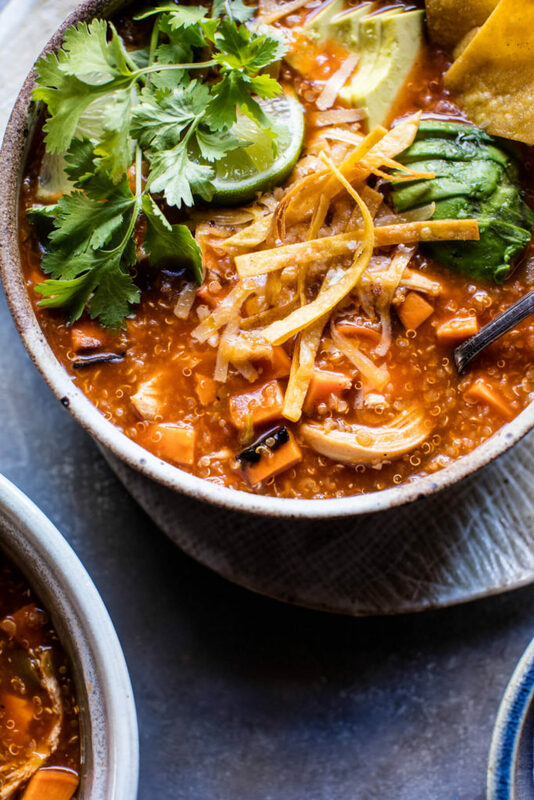 I’m saving the details of my week-to-week planning for future posts but when I consider what soups to try, I first filter my options through what I call our winter capsule pantry. 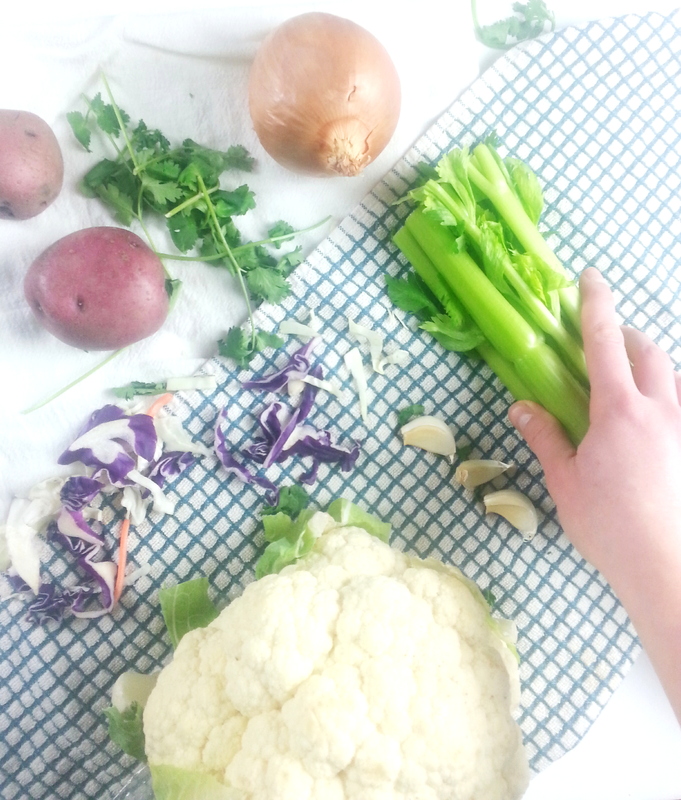 In winter, we are going for more root + cruciferous veggies. We ate cucumber and fresh tomatoes to our hearts’ delight last summer…now we’re enjoying cabbage, cauliflower, carrots, brussels sprouts, broccoli, kale, and celery. Aromatics like onions and garlic are year-round staples, though we do cut back on them significantly in the summer months opting for the spring varieties instead. Potatoes, lemons, limes, avocado and cilantro are also year-round staples as they stay inexpensive, or in the case of avocado there is a very good reason to keep them around. Just so you’re aware – we don’t have any food allergies nor do we side with any particular brand of “healthy” eating. We like simple and whole food. We like white rice, classic chocolate chip cookies, homemade pepperoni pizza, and cheddar cheese but I pack in veggies like crazy and we really don’t buy much for pre-packaged food unless it is frozen produce or canned tomatoes. Overall my aim is to help my children develop habits for eating nutrient dense foods and on the road to that I’d rather they eat a small amount of really good food over a large amount of a nutrient-deficient diet. So what makes a good soup anyway?? Use broth. Whether it’s homemade, from the carton, or made with bullion – broth is an essential component to a good soup. Even for chili. Learn to chop well. You need to think about what is comfortable to eat off a spoon. Carrot, celery, potato – too large and they start making the eating part hard. If they are differing sizes, you’ll end up with some mushy and some crunchy. Season your meat if it is being added in already cooked. It will absorb some of the flavors but, from experience, not enough. Even if it is just salt + pepper. I recommend using a slow cooker. Giving the soup a chance to simmer for hours gives the flavors a nice long time to blend…and you don’t have to stand at the stove. Cook on low setting OR soften onion beforehand. Crunchy veggies are undesirable. Carrots and onions can take some time to soften so if you don’t have time to cook on low (usually 6-8 hours), then saute the onion before putting them in (carrot too if you’re using it). Keep an eye on your liquid level. When I use my slow cooker I always use broth + extra water because the cooking process will evaporate some. 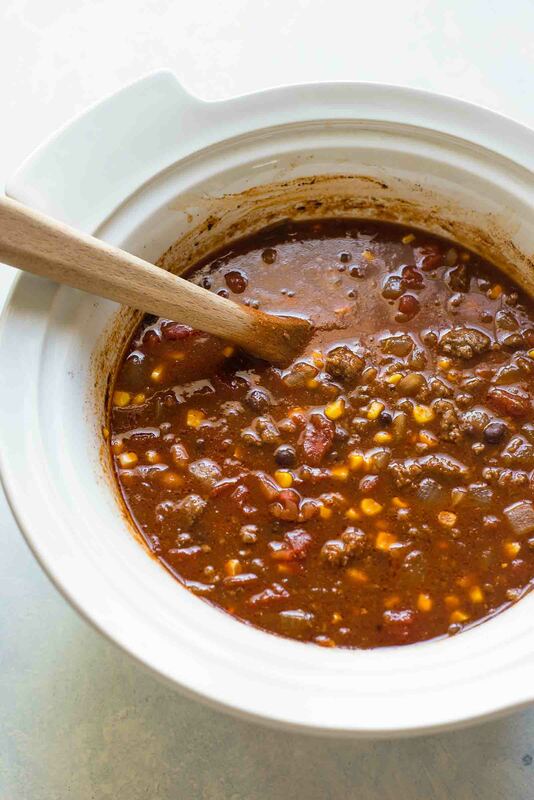 Even with chili where you’re going for a denser consistency, insufficient liquid is not tasty. Add more water if the dish is looking too thick (can happen if using a grain that is absorbing some) while everything is still cooking. Follow a recipe until you get a feel for the spice ratios. After a few years of intentional learning in the kitchen I can eye how much cumin to add to my taco soup and I can guestimate how much curry to add to my cauliflower soup. But until you have developed an understanding of how flavors blend + how much is needed to season effectively, follow a recipe. Salty soup is the worst (in my opinion). Add greens right at the end. 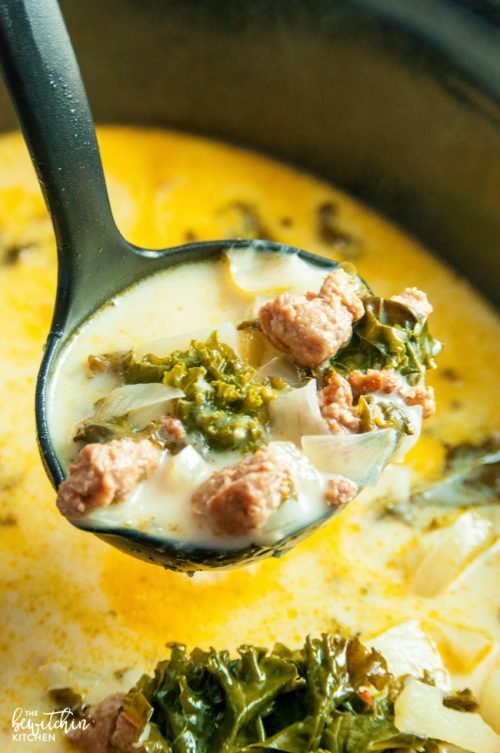 Kale is great in soup but don’t leave it to cook all day. Just the last 20 minutes or so stir it in. It will turn a bright green and soften slightly but won’t become mushy. Include your kids. We all know that the making of a tradition really sweetens the experience. Slow cooker meals are great in general for little helpers because there’s no hot pan to worry about. 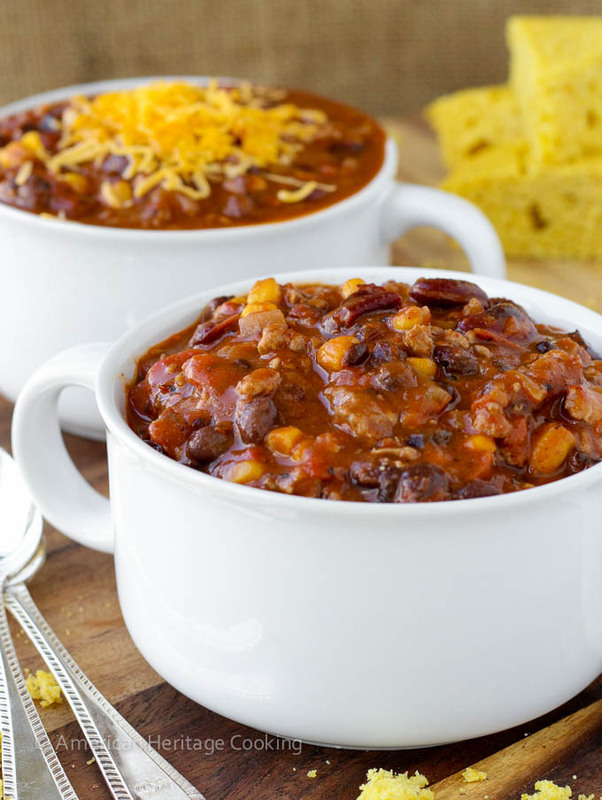 I remember the smell of our house on Wednesdays because we always had church so my mom often made Chili in the slow cooker. I also remember the group effort of filling our vegetable tray after grocery shopping. Involving your kids will imprint the beauty of the process of food preparation into their minds + hearts. 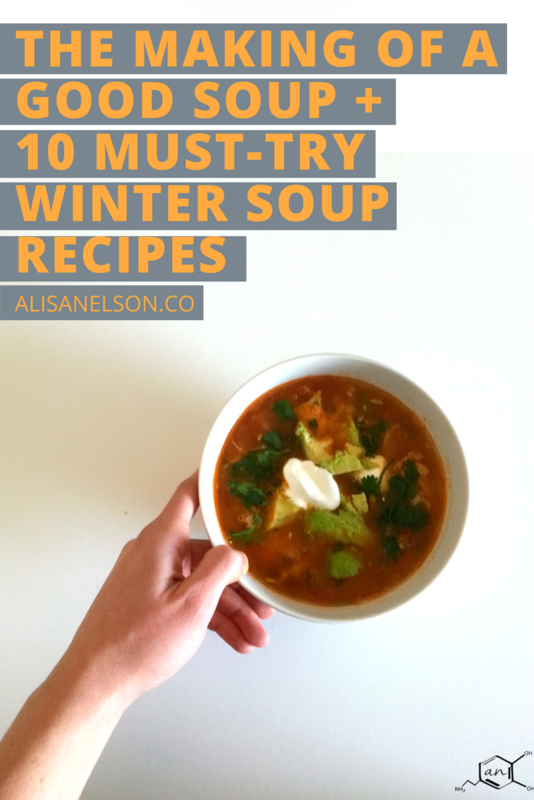 The following 10 winter recipes are both my inspiration (for my own creating) and my go-to recipes. I hope they inspire your own cooking as well! You can find all of them + more on my Pinterest page. 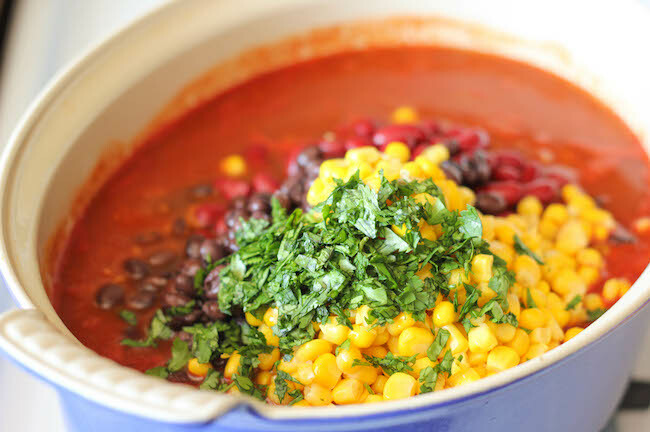 Half Baked Harvest has a Turkey Quinoa Enchilada soup recipe on her blog. I’m ready to dive into that bowl right about now. Whose with me? 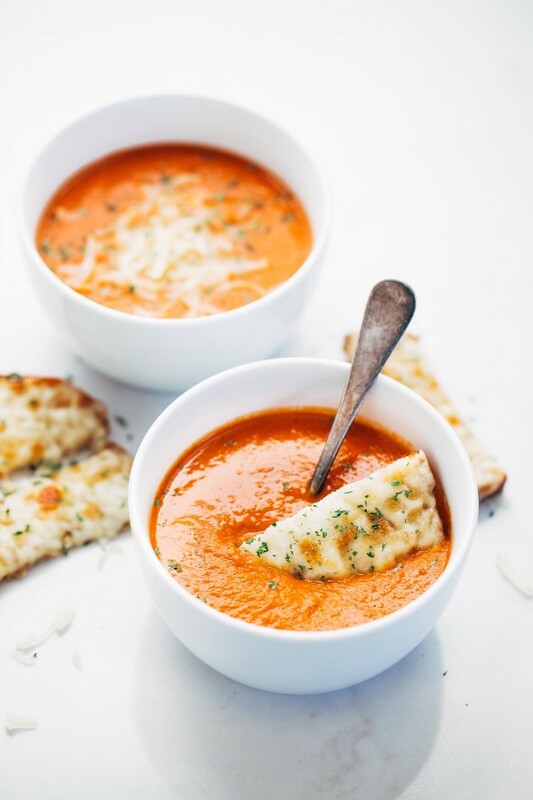 Pinch of Yum’s simple + homemade Tomato Soup. Now that your mouth is watering, comment below with which recipe you plan to try first! 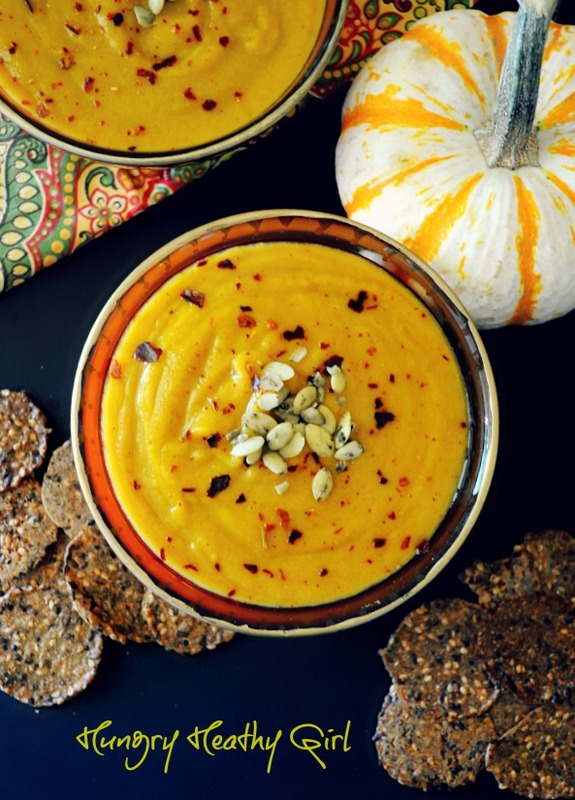 Be sure to show some love to these awesome recipe creators, pin all 10 recipes here!